These levels are exceptionally well made and designed to fill real world needs in the shop and home. No matter where you work, on the job or in the home, getting things level that are supposed to be level is crucial. Just as important is getting other things at specific angles necessary for their function. 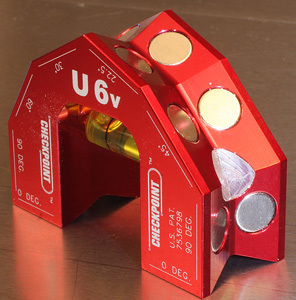 While Checkpoint makes a full range of levels we will look at their Ultra Mag G3 torpedo level and the U6 V-Groove level. The constant in the Checkpoint Professional Levels line is the use of high-end materials and the exacting precision of CNC (computer numerically controlled) machining centers. The result is accuracy out of the box that lasts as long as you can avoid losing them. 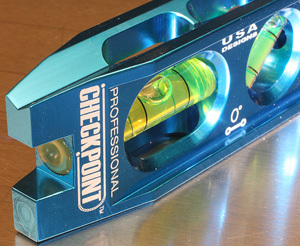 The Checkpoint Professional Level bodies are carved from high-end aluminum billet and then given an attractive and protective anodized color coating. The vials incorporated into the bodies are large and easy to read from many angles. All of the markings on the Checkpoint Professional Levels are also done very well to be easily read during use. The Ultra Mag G3 (#0300) is 8-1/2”-long with a 6061 T6 aluminum alloy body. The Ultra Mag G3 features a flat bottom surface and a V-groove along the top designed to be compatible with pipe up to 10” in diameter. The bottom edge has four oversized rare earth neodymium magnets that insure that it stays where you put it on ferrous metals. The nicely machined body has a 45-degree end for quick reference. Within the body are four bubble vials at 90-degrees, 45-degrees, 30-degrees and an elongated 0-degree orifice. All of the viewing ports are large enough to make the vials easily read from a wide range of angles. You can see the fine workmanship in the G3 body (left). Everything is easy to see and read. The U6 (right) has accurate angles with magnets to make a bunch of assembly, fabrication and installation jobs a bunch easier and more accurate. The Ultra Mag G3 is available in Blue (#0300B), Platinum (#0300PL) and Red (#0300R) anodized finishes. The street price is only $39.99 (3-26-2013) so it won’t break the bank to be as accurate as possible. 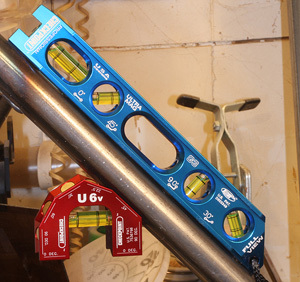 The U6 V-Groove (#0610) level is just 2-½” by 2” in size but its unique shape makes if compatible with straight, bent or radiused pipes and conduit. The angles machined into the body let you accurately measure 0, 22-1/2, 30, 45, 60 and 90-degree angles. Because a tool like this is so often used on ferrous metal pieces the U6 V-Groove level has 16 rare-earth neodymium magnets that let you stick it to the work to keep both hands free for setting the workpiece and securing it at the perfect angle needed. An oversized bubble vial runs across the inside of the U-shape making it easy to see when you have the work-piece at the precise angle needed. The U6 V-Groove level comes with a fabric carry case with a belt loop and Velcro style closure. The U6 V-Groove level is available in Blue (#0610B), Black (#0610BK), Platinum (#0610PL) and Red (#0610R) anodized colors. The U6 V-Groove level has a street price of $54.95 (3-26-2013) which doesn’t seem bad for something with all of the precision machining necessary to produce it. Like the Ultra Mag G3 above, the U6 V-Groove level is going to last a lifetime unless you do something very strange to it. I nearly left out the “In the Shop” section this time because there is little doubt that the Checkpoint Professional Levels would perform as advertised. I did use both of these levels in a variety of situations in the shop and they are very easy to read from angles beyond what would seem necessary. The fit and finish of the Checkpoint Professional Levels is remarkable in that the machining is exceptionally well done as is the anodizing. The magnets are easily stronger than any reasonable forces that could dislodge them in use so there is no worry about them not staying where they are put. That leaves both hands free for the work of setting and securing the workpiece. I also like the selection of angles incorporated into both Checkpoint Professional Levels reviewed here. The Checkpoint Professional Levels shown in this review are high quality, very durable and easy to use. If you want to be accurate with your installations or other work needing a level, the Checkpoint Professional Levels should be on your must-see list. Their pricing is just as attractive as the anodizing.